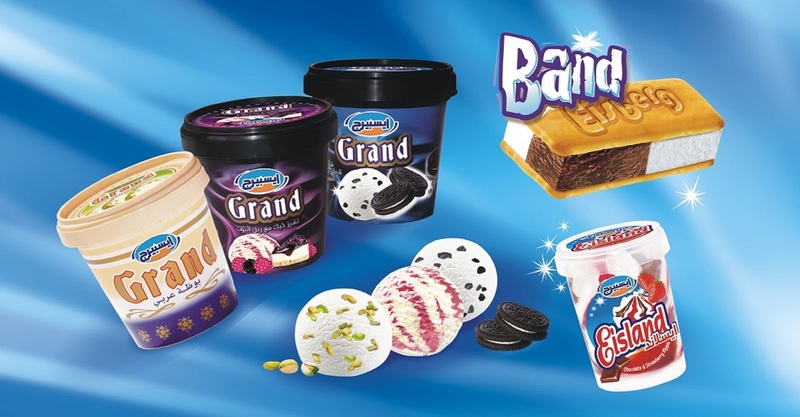 Sujab Industrial Compnay was established in 1996 initially as an ice cream producing company. It introduced its brand “Eisberg” in 1997 with a wide range of ice cream products and in the following two years introduced the wafer line, followed by the biscuits line. Today, Eisberg is a dominant brand in the local market, and has a Prominent position in all Middle Eastern markets. Sujab is recognized by its capabilities and production capacity, with its 30,000m2 facilities, modern technologies and fully automated production lines plus a team of 500 employees. Over the years the company’s size grew substantially, continuously expanding the range and variety of its three product lines. Sujab’s goal is to maintain its position as a leader and innovator in the regional market, offering the best quality, new tastes, and delicious products. Keeping up with the highest standards in quality and Good Manufacturing Practice (GMP), the company received the ISO 9001 and HACCP certification in 2005, which was later on upgraded to ISO 22000 in the year 2011. Being a market leader, SUJAB acquired the Jordan Quality Mark, making it the first company to receive this mark on the following categories (Ice Cream, Wafer, & Biscuits) in 2009. With a complete In-house laboratory controlling, Testing and Sampling everything from Raw Materials to finished products. Sujab assures consistent quality of its products to be up to its standards. Our R&D department works continuously on innovating new consumer products to serve the customers’ taste pallets and selling price. Delighted consumers are enjoying more than 100 products, and we promise to innovate many more. The Eisberg ice cream range covers a wide variety of presentations and flavors, including sticks, cones, cups, and family packs. The production lines are fully automated where no human hand touches the product until it is packed. Sujab uses highest quality ingredients to present the consumer with the quality products they deserve. Ice cream is the best dessert in all seasons, all by itself or as a companion to other desserts. The second country after USA that has the highest consumption of ice cream per person a year is Sweden. 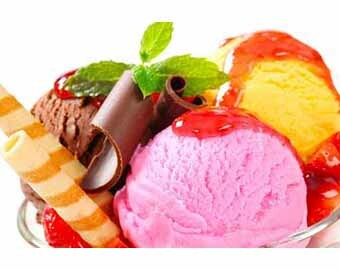 Ice cream is a healthy and delicious food that can be enjoyed both in the summer and winter. Ice cream is a healthy food and is considered a good as a source of energy that boosts the mood. Ice cream provides the body with vitamins A, B, C, D and E group, in addition to calcium, phosphorus, magnesium, potassium, iron and zinc. There is no chance that ice cream made under hygienic conditions would make your throat ache or burn...etc. According to experts, the only way for ice cream to cause any harm in your throat is for your mouth’s temperature to be below zero. The temperature of the ice cream you put in your mouth is instantly increased 4 to 8 degrees. Like all milk products, ice cream must be pasteurized, produced and stored in the right conditions. If Ice cream is produced and stored under healthy conditions, it will not be a source of health concerns, including any effect on the respiratory or digestive systems health. Experts state that it is important to make use of ice cream’s nutritious features during periods like adolescence, pregnancy and menopause in which the need for calcium is increased. They even advise pregnant woman who have nausea problems in their preliminary stages to eat ice cream. Be it soft, hard, or a cracker, Eisberg has it all. The secret of a delicious biscuit lies in the right balance of ingredients perfectly baked, to produce a biscuit with an exceptional golden color, aroma and crispness. Coffee or tea with your biscuit? Originally biscuits were made for sailors and soldiers from flour and water, which was a practical way of preserving carbohydrates. "Later came the idea of aerating the flour and eggs to make a sponge cake that was dried out, often in the oven – hence biscuit, which means twice-baked in French. You ended up with sponge fingers." But it wasn't until the 19th century and the popular emergence of afternoon tea that Britain began to regard biscuits as something you dunked in your cuppa(be it tea or coffee); a uniquely British idea that has been adapted around the globe! Wafers are the world’s favorite crunchy delight, a perfect snack enjoyed by all. Eisberg offers a variety of wafer cream-fillings and sizes to satisfy every taste. 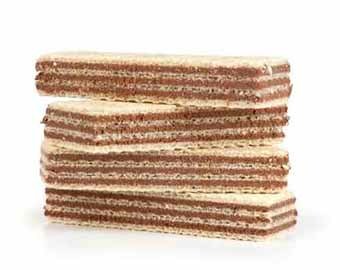 Wafers come in a variety of fillings and sometimes coatings, is a popular and favorite treat enjoyed by people of all ages and during any time of the day. The light crunchy texture is a master craft produced to perfection by Sujab, the Eisberg wafer range has grown in popularity among consumers. To satisfy every taste, the best flavors and materials are included to offer a wide range of wafer products.